TO THE POINT: Can you connect? Relationships are very complex things....and I am in no way an expert on relationships since I too, have many complicated ones. But what I have observed for a time now is how the quality of relationship seems to be affected by an ability to connect or not connect. Let’s define ‘connection’ with other people very informally as the ability to really listen to somebody’s heart and understand what he/she is trying to say; also to empathize with what another is feeling and wanting to do, as well as having good intentions to others in order to encourage them. If this is connection, then it follows that if you cannot listen well, you cannot connect well. In today’s world there are a lot of people who cannot listen well – not just listen as in hearing what someone really wants to say, but also listen by reading what someone is trying to communicate. How many times have you felt misunderstood by somebody just because they did not really listen or read what you were trying to say whether on social media, whatsapp or text? How many of those times, big misunderstanding could have been avoided if the reader had good intentions toward you in trying to understand your heart? And misunderstandings are never easy to resolve. So lesson one is: Listen well. Lesson two is to care enough to want to hear what the other person really wants to say. If you don’t care for the person it will show, and the person will not have the confidence to open up toward you. In listening with care then, you should be able to hear not only the words but also the intention of the words – and the person talking will grow in candour as they see that you understand what they are really trying to say. So lesson three is: Hear not only the words but also the intention. Another important thing to help connect better is to not make assumptions about why somebody is saying/stating what they are saying/stating. This is probably the most difficult to do as this is the point where you can either stop caring and therefore also stop listening if you jump to negative conclusions too soon. But making assumptions can sometimes help in understanding better....if you could have known the background leading up to the event, it will always make a difference in your perspective on the other person’s intentions. Lastly it is valid to be interested in somebody’s life to really connect. Isn’t amazing how easy it is to pick up if somebody is not interested in something, and how that affects your confidence in either wanting to continue sharing something or make you stop sharing further. Sincerity in being interested will affect how well you listen, which brings us back to lesson one. 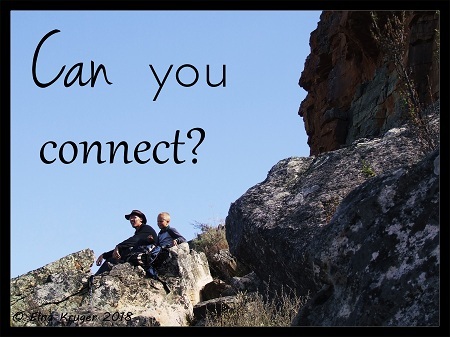 ·	With whom do you connect? ·	How connected are you with your friends? Another lesson is to learn that one may have many ‘friends on facebook’ but how many actual friends do you have in real life, to connect with on a heart-to-heart level? You need enough of those friends you can look in the eyes to see whether they really listen to your heart or not. This is not something you can do via social media. Isn’t it ironic that the ease of ‘connecting’ with people electronically does not necessarily help with actual connecting well with people in your real life? In conclusion – amongst my own children some just have a more natural ability to connect easier with other people. It has a lot to do with the ability to communicate well – my child who struggles the most with connecting with others also struggles to express himself well and verbalize his emotions and thoughts clearly. So helping your children learn to vocalize their thoughts. emotions and perspectives i.e. the art of communicating, is at the top of the list of relational skills to teach children.